Sometimes, it's better not to post pictures in my blog post. Oh, I tried. I really did. I sat on the couch, coughing (bronchitis, yippy), and trying to catch a picture of the mess surrounding me. But it's too bad, seriously. And because I've been off of work all week due to my illness, I have to work double hours this upcoming week, so I need to tackle the mess before my house guest arrives on Friday. Dirty dishes, stacks of clean laundry, gifts and gifts bags from last week's birthday party, tissues, empty coffee mugs, Legos...the list could go on forever. An overwhelming mess can linger for days or weeks. Often, it's not picking up the mess that is the problem. It's knowing where to start. So I thought I'd share my strategy for tackling an overwhelming mess in your living space. The order matters. It is chosen to give you small victories with the least amount of work and the biggest overall effect! 1. Throw out the trash. Generally, I start by throwing away any trash. The reason I start there is because it's easy to accomplish. Everything else needs a home. But trash just goes away. 2. Bring dishes to the sink and dirty laundry to the hamper. Note that I don't do the dishes or laundry at this point. I'm just getting them out of the messy areas. (Actually, my eight year old actually does the dishes and the six year old puts laundry in the washer and dryer.) It's sort of the same concept as the trash. You know the home for dirty dishes, so it doesn't take much effort or thinking. TIP: Assign this task to a partner or your kids to do alongside you while you skip the step 3. It's an easy task, but having help will make everyone accomplish more. It's hard for them to tell you no if you are working alongside them. 3. Pile other people's stuff on their chairs at the kitchen table. 4. Choose the most visual mess and clear that one completely. For me, the island is the kitchen is generally the cluttered area. But in your case, it might be toys scattered about the living room floor or piles of grocery bags still full on the kitchen table. Whatever is the worst looking mess, deal with that completely. This one small victory will make a visual and psychological difference. 5. Make a choice - finish cleaning or make a list in a planner. At this point, things should look much better in the space that you've chosen to clean. (For me, with an open floor plan, that means my kitchen and living room. But sometimes, it's the bathroom or a bedroom.) You might want to go ahead and finish clearing out the mess. That is fine! But if not, as long as you've done steps 1 - 4, just dedicate to yourself that you won't make more mess and make a list of what you still need to do to get the house in order. 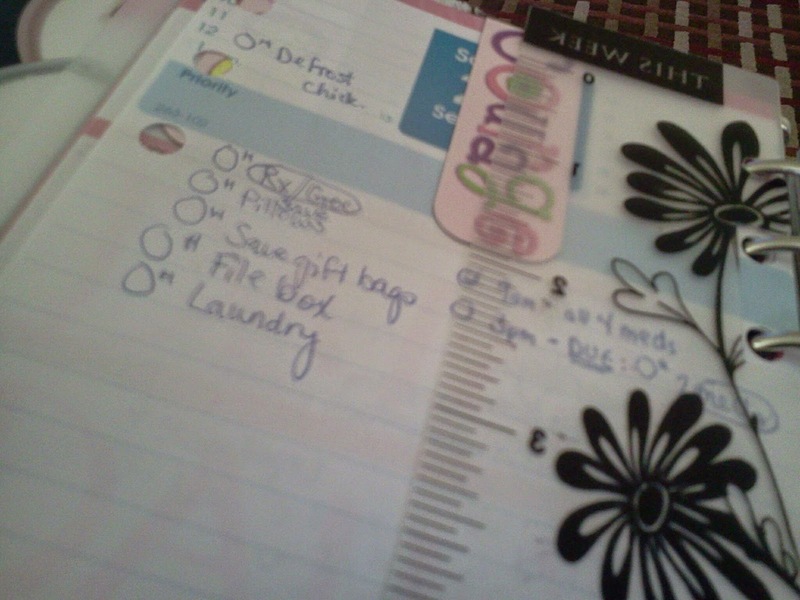 Each item is then assigned a day on my daily (if doing it today) or weekly pages (if during the week). It's okay not to finish. Knowing that you have that option will make an overwhelming situation doable. The idea is to make things much better so that you can handle it. Now, remember to erase the evidence, put things in their homes, and do routine upkeep so you can avoid getting into this pickle in the first place.